On Tuesday, February 25, 1969, the Doors were recording at Sunset Sound. That evening the Doors and their entourage went out to supper together at a local Mexican joint, the Blue Boar, where they stuffed themselves in a private dining room and drank beer and tequila for a couple of hours. After, they returned to the studio, and started jamming. Jim sang Elvis's "Love Me Tender" and, as the band played free from Rock & Blues, started improvising about the death of rock and roll. He kept repeating "Rock is dead," and "Listen, listen, I don't wanna hear no more talk about revolution," as if trying to damn the rock movement as something that was definitely over. "I'm not talking about no revolution," Jim sang. "I'm not talking about no demonstration. I'm talking about...the death of rock and roll....The death is rock, is the death of me....And rock is dead,...We're dead! All right! Yeah....Rock is dead! 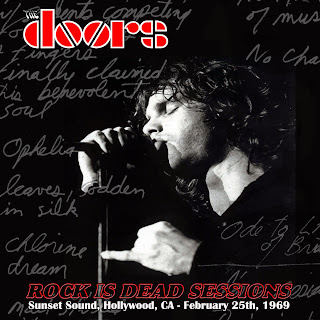 "The "Rock Is Dead" jam - forty-five minutes of primal bar-band Rock & Blues - was Jim Morrison's disgusted, explicit farewell to the rock movement that had launched him into immortality. The "Rock Is Dead" sessions remained officially unreleased for almost thirty years, but was notoriously bootlegged and became familiar to fans of the Doors. This version is the real best version that I have found! It's a remixed version with great quality and with no noise reduction...pure quality! Directly ripped from the master in mp3 at 320 kbps, constant bitrate!..artwork it's a my work :) enjoy it! 17. We had some good times, but there gone! un tremendo boot, es genial poder ver a Jim y al resto improvisando. Tienene que bajarlo y agradecer. Jim Elvis interpretando "Love me tender", es una de las rarezas que más me gusta, esta es una sesión que es una isla de la epoca, con largas improvisaciones, mucha comida mexicana cerveza y tequila como dice Paolo. I am no longer positive the place you're getting your information, however great topic. I needs to spend a while studying much more or working out more. Thank you for great information I used to be searching for this information for my mission. como le hago para descargarlo?? ayuda! !